Commission on Elections or Comelec said sorry to all registered voters and those who were registered in previous elections with names and sensitive informations including passport number and fingerprint that may be vulnerable to use for some illegal activities. The names said to be numbering between 55M to 70M registered infos that hackers took from the Comelec database and dumped to a searchable website entitled, "Philippines, we have your data" The Comelec asked the help of NBI to take down the website and it is still searchable and visible as of Thursday. The Comelec advised all registered voters to change their email passwords and other vital infos to prevent misuse of their privacy. contact credit card company to tell them maaring damay kayo"
The website "Philippines, we have your data" said in a statement at the opening of the website. "ATTENTION: there is no any passport information, no documents, etc. There is just personal data from the previously leaked by LulzSecPinas Comelec database. We have no responsibility and don't give any warranty of leaked data's accuracy - we have just extracted it from the dump." 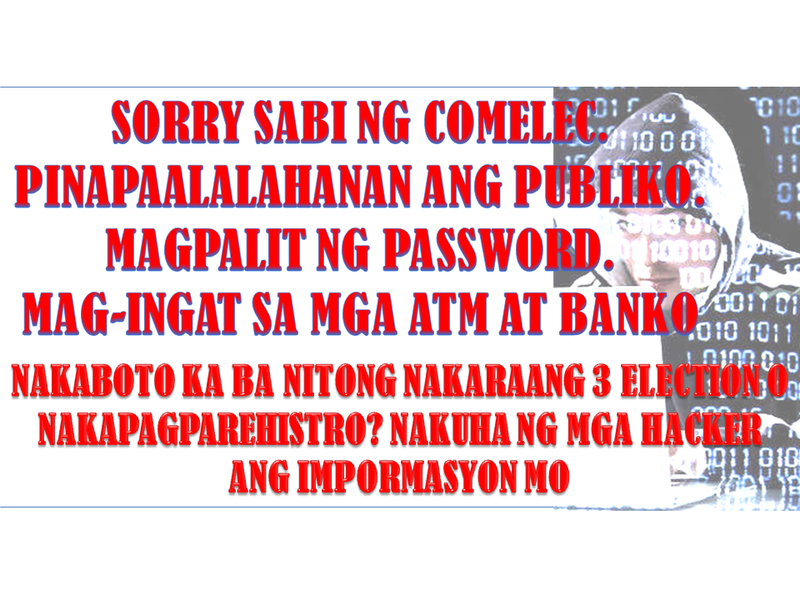 As you know (or don't know), recently LulzSec Pilipinas have hacked comelec.ph. They have dumped the database of about 70 million of Philippines voters and have published all the data at archive.org. The database contains a lot of sensitive information, including fingerprint data and passport information. So, we thought that it would be fun to make a search engine over that data. For lulz. Hackers just hack and download data from websites but we make it accessible for anyone. It's one thing to hear news about a huge data leak and another to is see your data in a public website. Maybe, at least now, government will start thinking about security of citizens' personal data.